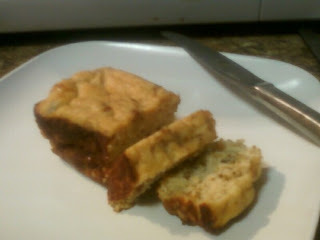 But yesterday I played with my food to come up with another recipe, this one using Quest banana flavored protein powder. I like both versions but this one is a heartier banana bread. Whereas I can eat a whole mini-loaf of the no-flour version, I am hard pressed to get through half of one of these suckers. And since I am a complete push-over incapable of following my own no-stats rule, I will give the nutritional information after the recipe, k? Meanwhile peel your bananas and place them in a large mixing bowl and mash them (I use a potato masher but if they are really ripe a wooden spoon would do). TIP: If you want to make these today and don’t have over-ripe bananas, stick them in that 350 degree oven for about 10 minutes, skin and all. Speeds up the process of nature! Add sweetener, extract and pie spice and mix thoroughly. Add eggs, one at a time and mixing the first thoroughly before adding the second. In a separate bowl mix together the protein powder, almond or soy flour, baking powder and salt. Add dry ingredients to wet and mix well. Mixture will be THICK. Finally, add walnuts and mix them through. Spray down either a regular loaf pan or a mini-loaf pan with non-stick cooking spray (or this, which is a baker’s best kept secret to prevent sticking!). 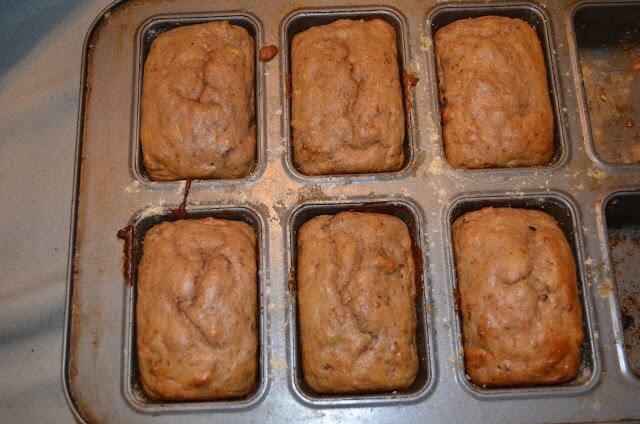 If using the mini-loaf pan, I used a half cup measure to empty equal parts of the batter into each loaf slot. Then I divided the extra batter between the slots. Bake for 15-20 minutes or until top is done and edges are browned. Another tip for successfully releasing quick-breads and cakes. Take them straight from the oven to a pan of really cold water. Just dip the bottom in the cold water for about 5-10 seconds. It helps seal the bottom and ensure that after you completely cool your baked good, it comes loose from the pan fairly easily. I have a sneaking suspicion that the half I ate after I took the above picture is the only part I’ll get. The divas each ate half of one last night and then this morning for breakfast! Sigh…story of my life. What is the baker's best kept secret? I think you meant to add a link but didn't. Cant wait to make this; it look FAB! Please mail this to me. I would like to eat it. Hey Nik! Do you happen to know if the Body Fortress scoops are the same size as the Pure Protein scoops? I want to make sure I am using the right amount. Great question. The answer is that in that amount (2 scoops) it doesn't really matter. Even if one scoop is a bit larger or smaller than another, the result is pretty much the same. I've made this recipe with all sorts of proteins, using 2 scoops each time with the same results. Hope that helps. Thanks for the info using different scoop sizes! I made these last night and followed the recipe almost exactly (just leaving out the nuts.) I baked them in a mini-mini loaf pan, which made 12 tiny loaves of banana bread 🙂 I offered them to my husband and intentionally left out the fact that they had protein powder in them. He couldn't stop eating them! I had to cut him off after 5. Super delicious, Nik. Thanks! Is that supposed to be 25 grams of total carbs? It says 125, and that doesn't seem right to me. Are the stats for a full loaf or 1 mini loaf? Hi Anonymous. The stats are for one of the mini-loaves. Typically I slice the mini-loaves so if you do the same, divide by the number of slices you end up eating. Hope that helps! If you cannot find the Adkin's baking mix, can you use whole wheat flour?